Jared Luke from Juniper Systems teaches some home school students about programing. Aiyana Tsipai is keeping track of his lecture on her computer. Sharilee Griffiths wants to reinvent the way kids in Cache Valley spend their summer vacations. The executive director of My Discovery Destination is a community activist trying to change the world, starting with giving kids and families opportunities to grow together. 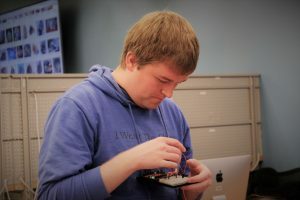 Jonathan Powell works on a simple circuit board used as part of the programming class of home-schooled students learning about computer programming at Cache Makers at BTEC in Logan. Kidpreneurs will use the same space. As part of this year’s My Discovery Destination Summer program, Griffiths is holding a Kidpreneur program. The kick-off meeting for kids, ages 8 to 18, will be on March 29 from 4 p.m. until 7 p.m. at Bridgerland Technical College West Campus, located 1410 N. 1000 W. room 1910. Kidpreneurs introduces both kids and teens to the entrepreneurial world in a hands-on way. In the beginning, Kidpreneurs was just to be a summer program, but Griffiths received requests to extend it throughout the year. Amber O’Quinn, program coordinator for Cache Makers said they have cutting-edge facilities and are willing to support what Kidpreneurs are trying to do. Cache Makers is a 4-H facility that has an area stocked with 3-D printers, a laser-cutter, soldering stations, 3-D modeling or CAD software, and a woodworking area. She said they could always use more volunteers. Griffith is working with the Logan Downtown Alliance to hold a Kidpreneurs Expo to showcase products at some point during the summer. 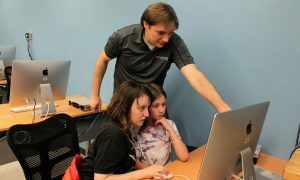 Chayce Tueller and Elsie Jeppsen get a little hands on instruction from Jorden Luke, an employee of Juniper Systems. Luke is teaching the girls about programming at Cache Makers at BTEC. The Cache Makers will be the location of Kidpreneurs of My Discovery Destination. During the month of April, My Discovery Destination will be building mini-model houses sponsored by area realtors and builders. The youth will be invited to draw up plans to their dream home. In May, participants will present their home designs to others in the group. The group will select three mini homes to build. During the rest of the summer, participants will build the homes to scale. In September, the homes will be auctioned with the money going to Cache Makers. For the first meeting, O’Quinn said it would be best enter on the northwest. Thank you for reaching out! We’ve corrected the photo caption.